The imagination is a powerful thing, but do you want to leave it down to your minds vision to convey and communicate the image of how your event should look? Working this way may lead to misinterpretation of ideas, frustration and a disappointing result when the look and feel you envisioned isn’t achieved on event day. The X3 team works with 3D Rendering software, allowing you to see what your event will look like ahead of time. We’ll design ideas based on your initial brief and will work with you to ensure the final creation is bespoke to your specification and delivers maximum impact, whilst also being mindful of your budget. Having a clear and tangible image that you can share with the wider event team, early on, will ensure everyone is on the same page when it comes to delivering your event. The staging for your event is likely to be the focal point for your attendees and where the most important messages are going to be communicated from- capturing the imagination of your audience from the get-go is therefore essential. Our AV specialists will work with you to design an inspiring concept and deliver a professional set build that will complement your overall event theme. It is worth noting that your budget will influence what you can achieve, but our skilled and knowledgeable AV experts will always advise on how to get the most ‘bang for your buck’. Is there anything worse than being at the back of the room, leaning forward in your chair, trying to catch the words of the speaker on stage? Similarly, being jolted back into your chair from the shrill of microphone disturbance is an equally as unpleasant experience and can be a real AV fail. The delegates experience of the day can be profoundly affected by the way they hear and take on board the information being delivered. When working with X3 you can be assured that we work with that highest quality PA and sound systems and take care of all technical elements. What this means for your event: a slick and seamless sound production, expertly transmitting sound content. Content delivered in the written form will most likely be a prerequisite of your event presentation, but beware: an overload of text heavy slides may cause your audience to disengage and switch off. How do you stop this? How do you entertain, yet inform your attendees? To make life easier for our clients we offer an integrated service of creating engaging and tailored video content; allowing you to present key information that will connect in a meaningful and emotive way with your audience. Recording event content can also be useful collateral pre and post-event: watch the event back, take pride in how it was executed and make learnings to make your next event even better. We can also professionally edit event video content for your marketing purposes; an opportunity for your event to make an impression before it begins and after it ends. Whatever your video content needs, the team at X3 can offer you the right service to make your vision a reality. The use of light during an event can have an unrivaled power, especially in combination with other incredible content. Tap into our specialist knowledge of how to best utilise lighting effects, to connect the elements of your event spectacularly. We’ll work with you collaboratively and coordinate the kit required to create an immersive event atmosphere, that will transcend your expectations. 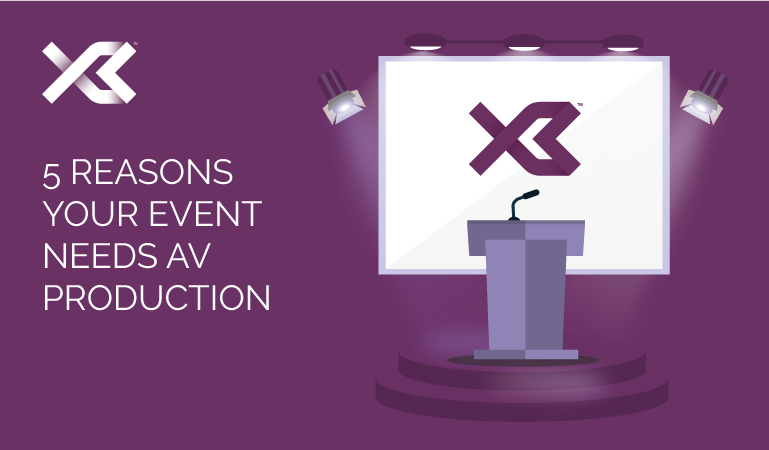 In a competitive landscape, it’s important to understand the impact of AV production and its ability to lift an separate your event, to differentiate your messaging and offering. So, what’s next? Talk to X3 HQ and we will work in partnership with you to understand your event and the requirements specific and unique to your brand. We will help balance your creative ambition with your budget and ultimately deliver an event that will captivate.